The Nonfarm Payrolls(NFPs) data released at 13:30, March 7, 2014 were better than expected. Expected NFPs were 149K and the actual were 175K. 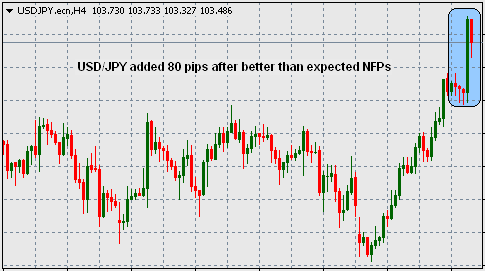 The better than expected NFPs rallied the USD/JPY to add about 80 pips. The question is that will the NFPs be able to push the USD up sustainably. The poor unemployment and trade balance data trying to protest the bullish movement of USD.